White Shannon Barrier Door Mats with vinyl backing. modern and contemporary deigns. Cheap and Affordable Door Mats to buy online today at Abbey-Carpets. Become the talk of the town with this new Shannon White Barrier Door Mat. Extremley stylish and vibrant this Door Mat is the perfect accessory for your home. Made from polypropylene cut pile with a vinyl backing it is of the best quality on the market. Brighten your home today with a Shannon White Barrier Door Online today with Abbey-Carpets. Bring a bold modern style to your home with this new Colorit Black Barrier Door Mat. Machine washable and amazing value for money they are of the best quality on the market. Affordable door mats to buy online today at Abbey-Carpets. Liven your home up with this new Colorit Grey Barrier Door Mat. Provides a luxury underfoot unlike any other door mat. Affordable door mats to buy online today at Abbey-Carpets. Brighten your home today with this new Furbo Grey Barrier Door Mat. Amazing quality for rock bottom prices. Affordable door mats to buy online today at Abbey-Carpets. Bring a Vibrant and modern feel to your home with this new amazing Blue Shannon Barrier Door Mat. The Perfect way to brighten up even the darkest of doorways. Affordable door mats to buy online today at Abbey-Carpets. Brighten your door way and greet your guests with a warm welcome with this new Green Shannon Barrier Door Mat. Vibrant, stylish and modern it is of the best quality on the market. Affordable door mats online today at Abbey-Carpets. Bring warmth and a modern feel to your home with this new beautiful Grey Shannon Barrier Door Mat. Highly fashionable and stylish they are of the best quality on the market. Cheap and affordable door mats to buy online today at Abbey-Carpets. 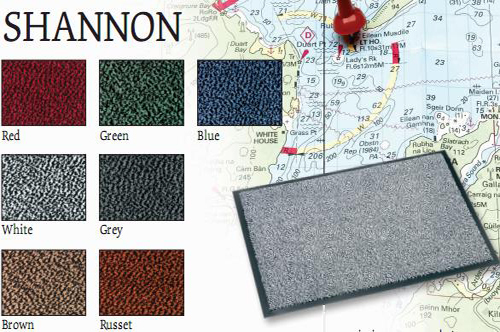 Bring a stylish feel to your door way with this new Shannon Red Barrier Door Mat. A modern design with bright and vibrant colours. Cheap and affordable high quality door mats to buy online today at Abbey-Carpets.